I couldn’t tell you my first story. At the hunting lodge we went to when I was a boy, they had a stack of Outdoor Life magazines and they had McManus stories in the back. I know I read the Belcher there, and there was also a Rancid Crabtree story where he came to school to talk to the class about his ‘job’. But there were others I can’t recall right now. Years later, I found the collections and started snapping those up. But my first exposure was, shall we say, in the wild. A few years ago, I e-mailed McManus and told him this. And the unvarnished truth: He helped me get a deer. I brought an outdoor life up into the stand, and was in the middle of reading it when it occurred to me I better check a couple of times. I did, and got myself a nice 120-pound doe. I don’t hunt these days. The hunting lodge’s leadership drove a few people away with some favoritism behavior, and reacted by upping the fees so their income (which mostly went to the upkeep of the place) stayed constant. But a few more couldn’t afford the fees, so they had to go elsewhere, and then we couldn’t afford the fees, so we had to go, too. I miss that old hunting lodge sometimes–the three bedrooms of bunkbeds, the awesome breakfasts my father made there, the company in the evenings–they were a sociable bunch of rascals, and kind to a boy from the age of six to the age of 18 or so, when I knew them. And I miss the stack of hunting magazines. Maybe one day I’ll find another place, and stock it with a pile of McManus books. And the membership can bag deer because deer come out to hear what that loud cackling sound is up in the tree stand, because OBVIOUSLY that can’t be a hunter…. 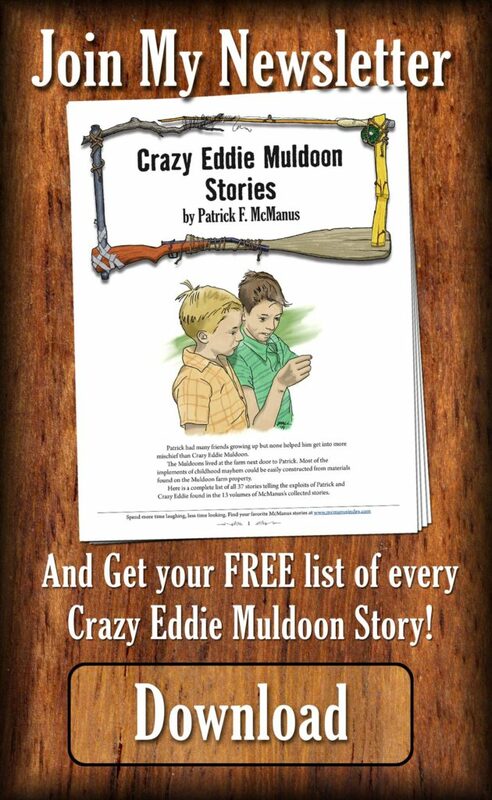 The first Patrick McManus story I hear was “My Stone Age” It was in Field and Stream. I’ve never seen it in any collection. I was suffering from after Baby Blues and would escape to reading anything I could get my hands on. (That’s why I picked up my husbands hunting magazine when I hate hunting) After that story I made sure my husband always had a subscription to Field and Stream and then Outdoor Life. The first McManus story that I can remember reading was the Chick-a -nout Narrows. And it was shortly after finishing a “Fine and pleasant misery”that I realized that many of the stories that McManus wrote about his youth were very similar to my own experiences as a boy. It formed an instant kinship to Patrick even though I have never met the man. I have read every story that has been published since, and particularly love listening to audio versions on my fishing and hunting trips. Thanks David! That has been a particular gift that Patrick has, writing his experiences in such a way that so many of us connect with. To my recollection, the first McManus story that I remember was read to me by my older brother was Tenner Shoes. Before that I thought that all literature was boring. That was back when he was still writing for Field and Stream. Then I lost track of him for a while until I discovered that my high school library had a collection of Field and Stream and Outdoor Life. I spent many a spare moment reading them there in that sanctuary of knowledge. Then one day I was called upon to account for my lack of book reports. I wasn’t going to be able to graduate sophomore English without enough pages. My teacher, who was known around school to be especially evil, asked me if I had read anything at all. I told her that I had read some articles in Field and Stream and Outdoor Life in the library. She asked me about how many and how many pages they would make in a regular novel. I surmised 5 of 6 and I’d read about 30 of them. That was good enough. I wrote a paragraph on each one and she called it good. The rumors about here were evidently exaggerated. Years later, as I was teaching English as a foreign language I would use his stories to help enrich my students’ vocabulary. Bless him. My first McManus story was discovered around the age of about six, maybe seven? I was an avid reader at an early age. My parents were working to complete their McManus collection at the time, and my father had left their most recent acquisition on his chair arm in the living room. Normally I wasn’t interested in what the adults might be reading, but then I also wasn’t accustomed to seeing my typically austere father smile so much at a book. So I investigated this magic book, “The Grasshopper Trap.” The first story in the book was “The Skunk Ladder.” Needless to say, when my parents found me two hours later, already halfway through the book, we had the “do not try this at home or when we visit the farm” talk. Dad wasn’t even mad I’d lost his place in the book, nothing short of a criminal offense in both mine and my parents’ households to this day. I was an instant McManus fan, and later in life it remained common ground between my parents and I. What a great story Samantha, thanks for sharing it!